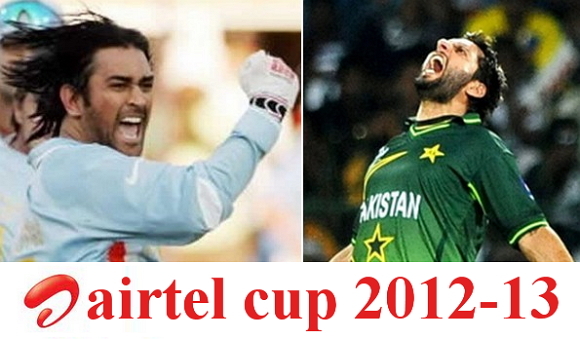 Here the good news for all India and Pakistan cricket fans BCCI officially announced a schedule for Airtel Trophy 2012 between India and Pakistan. Indian home ministry recently clearance to Indo-Pak series. As per BCCI announcement Pakistan team arrivals to Bengaluru in 22 December 2012 and plays two T20 matches and three One Day international matches with India. After tournament completed Pakistan team departs on 7 Jan 2013 from India. But BCCI did not announced about match begin timings. But according to me all matches may be day night matches. Search tags: Ind vs pak schedule, india vs pakistan schedule, india vs pakistan fixtures, pakistan vs india complete schedule and venus, airtel cup 2012 schedule, ind vs pak fixture, print india vs pakistan airtel cup schedule.